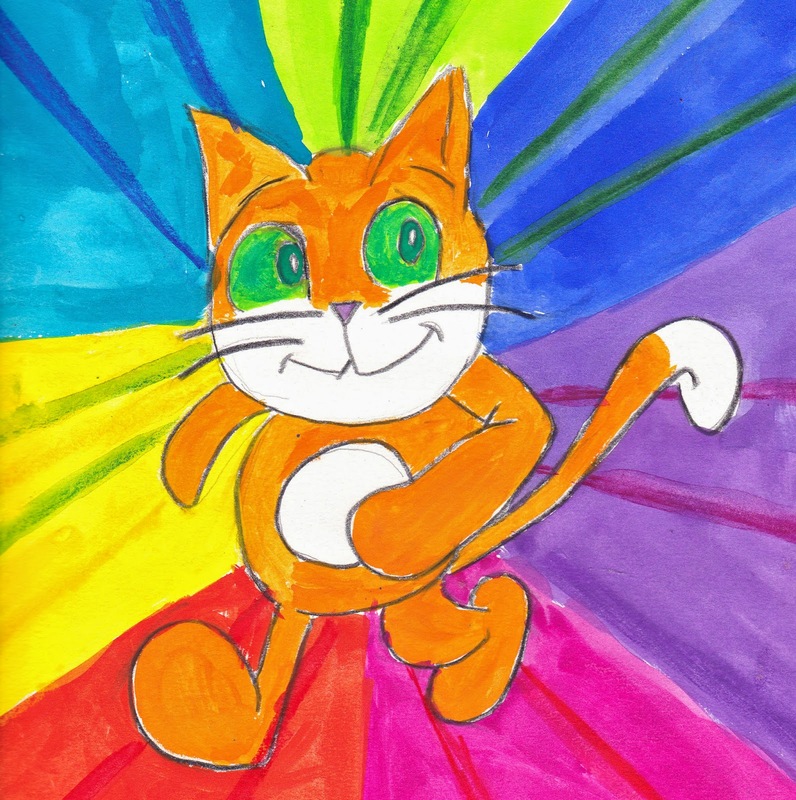 Scratchy the Cat in Watercolor Pencil and Paint. Ahem.. did anyone read my story in Quartz about Scratch? Every school should have it! 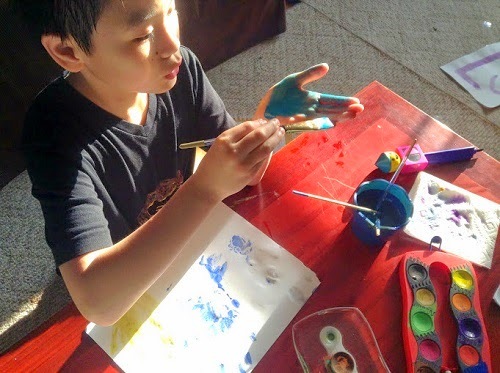 I still have memories of the days of finger-paint and tempera paint. So many colors but so watered down... and it was just everywhere. But now that my children are older and painting, one thing I am noticing is how neat they have become during "art time." I have also noticed them examining their supplies, staring intensely at their brushes and at the colors. I think they were trying to figure out what they would do before it hit the paper. That is a good thing!!! 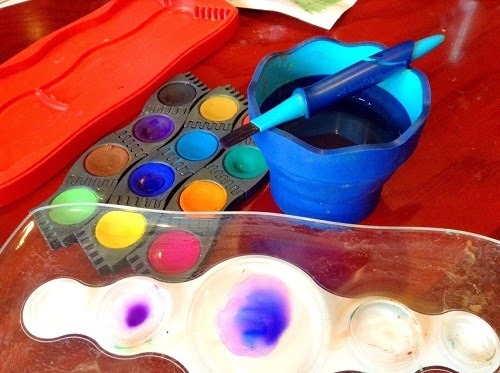 Kids notice upgrading everywhere, your phone, your TV, even their toys are more sophisticated but what about their art supplies? 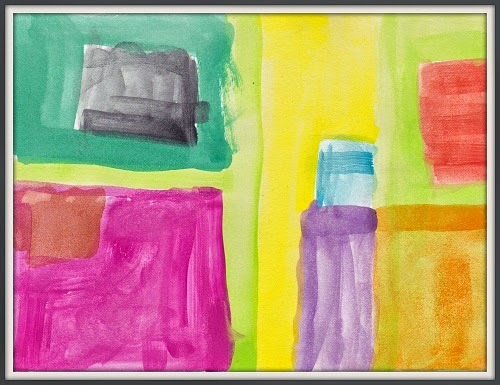 You would think a 7 year old and 10 year old wouldn't notice that this watercolor was better than the one they used when they were in preschool but I knew they noticed. I could tell by the way they painted and what they painted. Look, a white shirt! I wasn't worried. They are older now! I thought he was going to paint a sun. I think this became a mean looking parrot and lizard. I absolutely love this one. First of all, do not fear, this is really affordable. I know you have been to Staples and seen the kids' art supplies and then you walk a few feet further down the aisle and gasp- some of them are even locked up and cost five times more that the kids' stuff. To be sure, your kids don't need this kind of upgrade. Moreover they really don't need tons of colors with waterpaint. I think less can be more here. 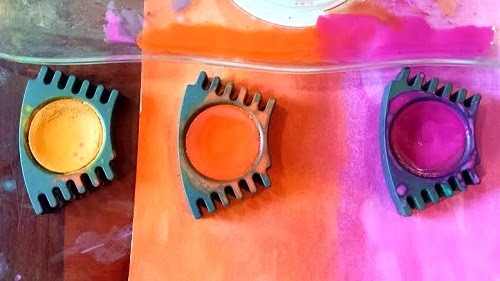 What you need to support this process is some good paper - specifically for watercolor projects (I can't stress that enough), a good brush, and a cup of water. Luckily, I had gone to the Toy Fair and stopped by the Faber-Castell booth. I saw their paint, their collapsible paint cup and clic and go paintbrush I wanted to grab them and run off. It was the coolest thing ever but is it really affordable? Obviously, the answer is YES! I especially love that cup! Yes, if you run out of ONE color, you can just buy the one that you want- not a whole new box. 'Tis Collapsible!!!! And the ridges are excellent brush holders. So smart! My son thought this was so cool. I like how it will save the brush shape. Two things to see here: 1- the clear plastic palette allows you to make more mixed colors that match what you have already used on your paper. 2- I was struck when I realized that the red color of this set was not red-red but rather vermillion. I doubt this was an accident. I think the absence of regular red is refreshing here because kids choose red too much. They can try out vermillion which covers much of the Forbidden City in China and is the color frequently used by Titian. I also saw something really interesting happen with the Connector Watercolor Paints. Tester #2 was putting them on his hand! 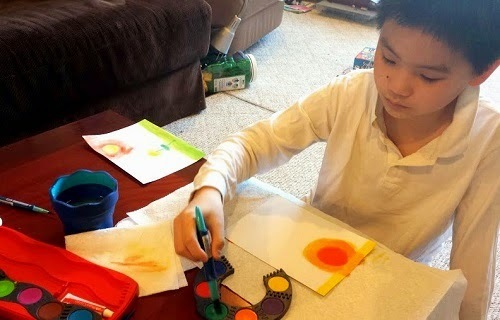 He has sensory issues and had always disliked finger paint but I guess good watercolor paint is OK? I guess so! 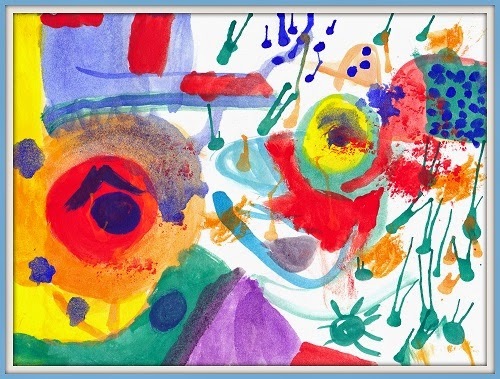 Folks, if you have a sensory-over-responsive child who for some reason needs to be fingerpainting, consider watercolor paint instead. It will leave better marks and the more pressure they apply, the better it is for their sensory issues and for making the actual mark itself. AND... I suppose the texture is well.... less gross? Come to think of it, why is finger paint so custard-y? Either way, the kids had fun painting their hands. If you only knew how much he hates putting stuff on his hands but like I said: kids notice quality materials. Putting pressure on the hand will likely help with yukky feelings for the sensitive. This guy totally did this on his own. I was floored. He is one of those people that runs to the sink when he has a smear of anything on his hands. What was really interesting to me about all these products was the respect for painting that it brought out of the kids. The little booklet that came in the Do Art Watercolor Pencil Kit was thin and compact but the pages were thick and glossy enough that if it met a little water or waterpaint, all would be well. I think that is a thoughtful gesture. More importantly, the booklet gave you tips on how to watercolor. There are different techniques! Some using salt even! Who knew? This booklet gave just the right amount of information. It showed lots of techniques but didn't go too much in detail. Everything was in color and there were plenty of visuals too. Still, this Watercolor Pencil Set was only $14.99 and it included high quality watercolor paper, a brush, and 10 watercolor pencils, along with the booklet. It's as if the box is saying, "Yeah, you're a newbie but we want your first time to be special." Moreover, if you child didn't love it, you would moan and groan over the money. This set is just right! Get another brush and a cup of water and you got yourself a playdate. Thank you booklet. You made this easy. We can splatter paint just by rubbing a paintbrush with a pencil. Simple. I think I made this one up. 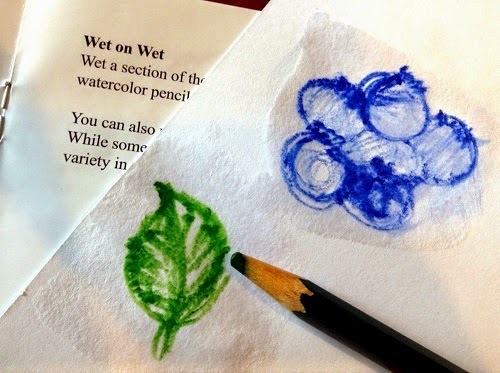 Apparently, there is a technique called wet on wet using brushes. But this booklet taught me how to use it with the pencil! Very cool! I didn't need a paintbrush to do this. Again, I can't emphasize this enough. 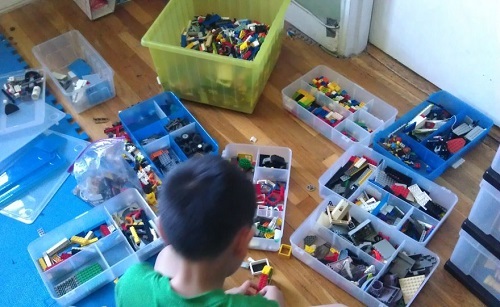 Believe me, when my kids are trying something new, I always opt for the cheap version before I make the investment buy on something really nice. But guess what, with the Faber Castell products, you really can feel like you are splurging even though you didn't pay splurge-prices. With all that watercolor has to offer, I don't see any reason to settle for any less. I even bought this as a birthday present to give to my son's friend this weekend. The connector set with the Brush With Genius both frequently on sale at Amazon makes for a totally awesome gift. Check out my video, this is yet another place where science and art can not be separated. This brush makes music with electricity and paint! USE Rafflecopter to Enter This Amazing Contest to Win Your Own Set of wonderful watercolor products including the 12 color Connector Paint Set + DO ART Watercolor Pencil Kit, Clic and Go brush set, and Collapsible Water Cup! It's a dream!!!!! 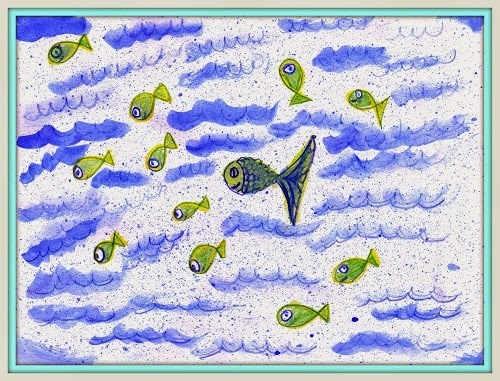 Another winner from Faber Castell- Metallic Art Set Review Here. I just clicked on. They look amazing. Anyone of them that seem particularly interesting to you? And I don't think I can really review a school pack unless a school tested it for me. That could be tougher to do. What I'd love to know is what do you seek in a school pack? Aside from quantity and quality. 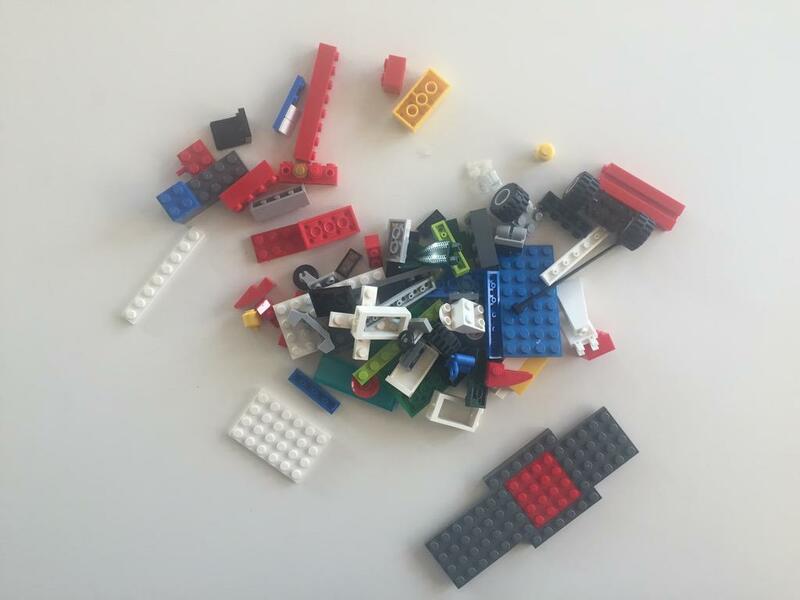 If you just want to know about a product overall attributes, I can certainly look into that. BTW, thank you for leaving a comment. 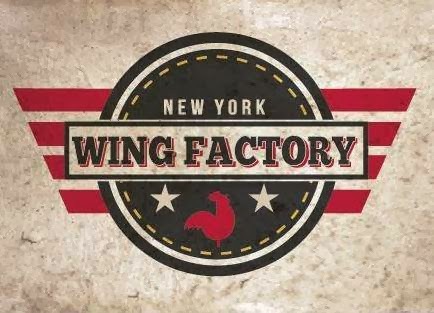 I am honored when teachers visit here! You post just got me thinking in terms of my students poster projects and possibly upgrading my colored pencils, crayons, art supplies. So I guess I'm wondering whether or not it's worth investing in some of the school packs to upgrade from crayola and rose art stuff that I stock up from dollar bins. My "post got you thinking" ... what a wonderful compliment! Thank you! Think like this for a minute. Have you ever walked into a fancy restaurant/hotel restroom and found yourself drying your hands really slowly? Might that have been because you noticed how soft and thick their disposable paper towel was? I think that happens to kids too with art supplies. With crayons, the beeswax glide on like butter. You would have to rub really hard with a cheap crayon to get rich color and still you wouldn't achieve the same effect as you'd get from beeswax. I don't know how old your children are but FC colored pencils also glide much more smoothly. 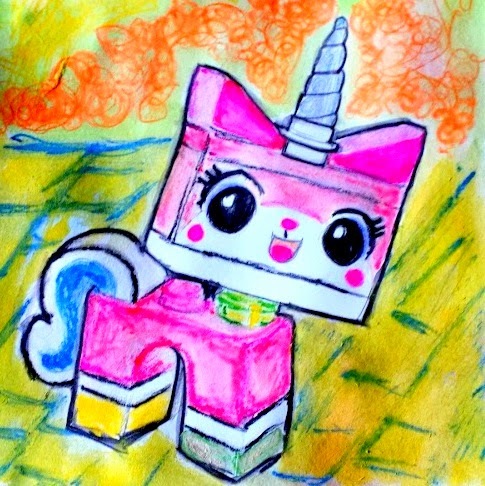 However, if you want to upgrade and really have the kids notice the upgrade then I would consider the watercolor pencils. You can buy them without the kit, in fact, those look better than mine. And you can teach new techniques which you probably know, kids love to learn. 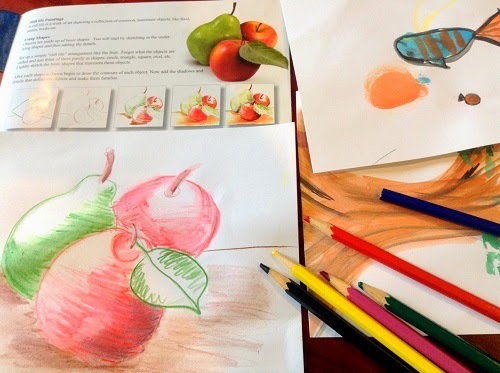 Kids are less used to watercolor pencils anyway and so they would need your guidance. I also like their connector pens which is a really sensible way to color with thin markers. There are great online lessons on that! I think it would be cool for you to review any of the Shrinky Dinks kits from Creativity for Kids. The Monster Lab set looks pretty neat! From the Faber Castell site, I am incredibly interested in the Gelatos! I see that you can use them with brushes, stamps, and other tools, and can use them on paper, wood, or canvas. How versatile! A clear and well laid out website. The information provided on each page is rich and informative and is a delight to read. The banner at the top makes the whole site feel like a professional business place, where people can come and read up on Affiliate marketing training. Each section starts with clear and simple headlines which draw you in. Faber Castell's Collage Kit...I could see kids getting started with a kit and taking off using available materials....I love collage and took a class at a museum once. I didn't do very well, but the process was fun and I'd love to see what children do with it. LOVE those painting pictures with the boys! the Complete X-Treme Sticker Maker Comic Book Collection #1839 intrigues me for my students: They are very into making comic books, but struggle with lay-out and design. I'm wondering if Creativity for Kids isn't on to something here? If students can't figure out what to write about or finish on a given day, they have to make a comic book. That often gets them writing and planning and we can go from there: how would you tell this story if you couldn't use pictures? what words would this character be saying right here? It must be working b/c they are becoming writers, but more ideas are always welcome! P.S. for me, I'd love to see what your reviewers do with the wooden shapes kit! I love natural products in the hands of kids. Creativity for Kids has some fun and educational looking products in their unique section, so perhaps review one of those products? They have neat gardens and terraniums! 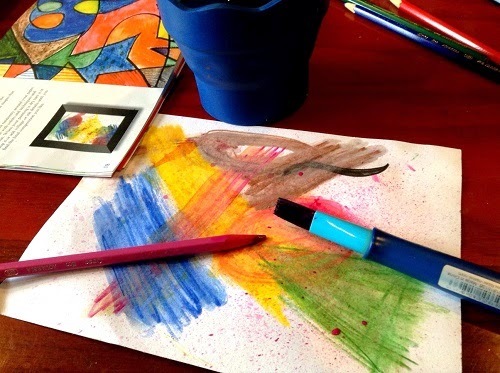 I would love to see more art supplies geared towards younger kids! I'm also really curious about the gelatos! Are they messy? How quick do they dry? 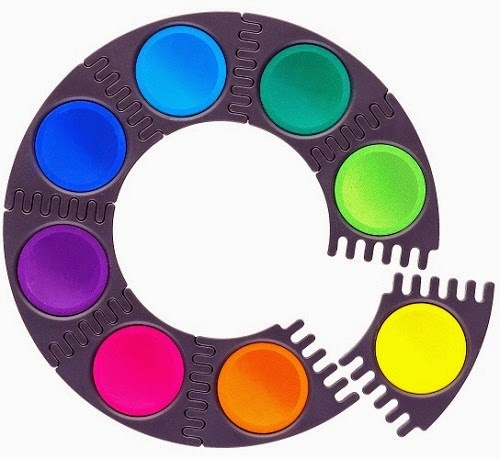 My son gets frustrated by pastels etc (stuff that smears and "messes up" the picture he has in his head), so I'm wondering how these are to work with. 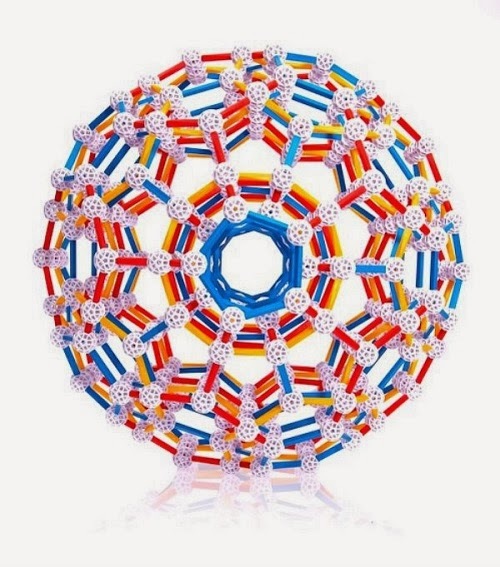 We love Creativity for Kids and didn't realize it was a Faber Castell company. My oldest is really interested in the Grow and Glow Terranium and the Pop Up Book Kit. On the Faber Castell site he really wants the triangular colored pencils and the sketching kit. Pencils are really the medium he likes the most! 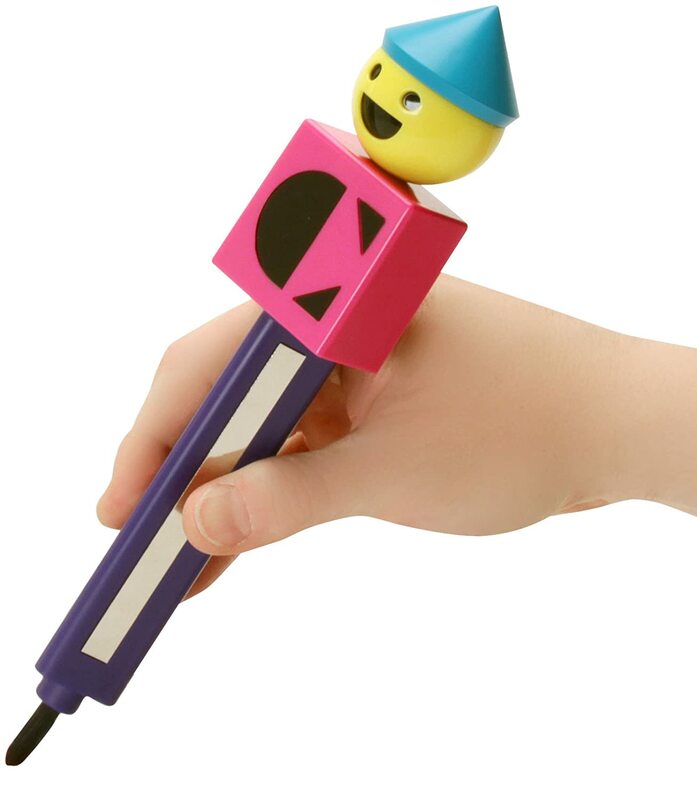 The clic and go paintbrush looks awesome. I wonder who long it would last? meaning if the child broke the "lock" would it still be useable? 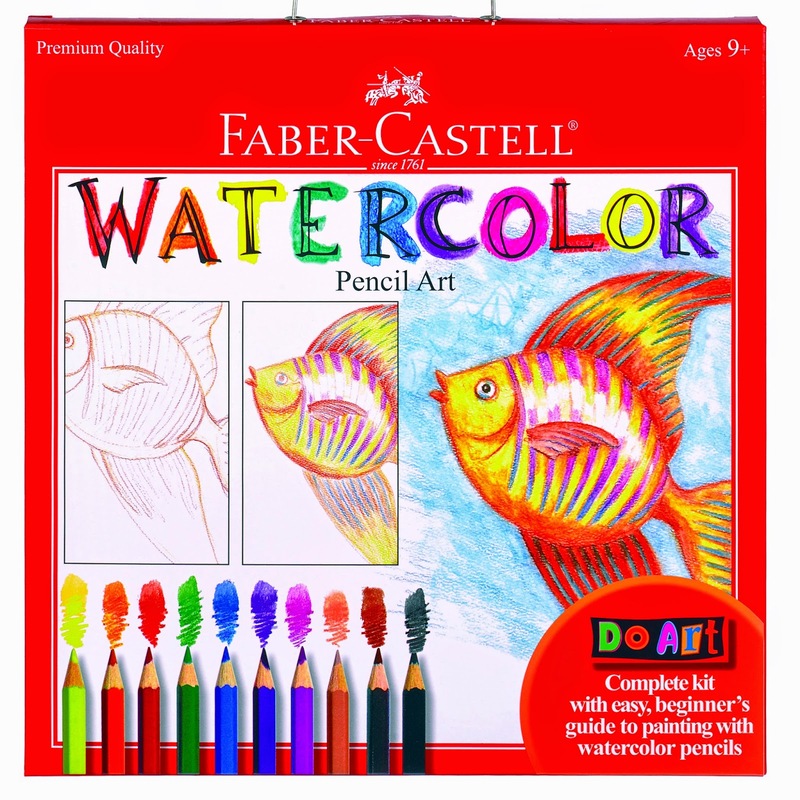 We love Creativity for Kids and didn't realize they were a Faber Castell company. My oldest was really interested in the Grow and Glow teranium and also the pop up book kit. On the Faber Castell site my oldest is most interested in any of the pencils from colored pencils to the sketch pencils. It's his favorite medium. The gelatos look interesting. Is there a difference between those and the gel sticks? nikki, i love your question. I suppose if the lock was broken then you can just yank the cover off and you would stiil have a good brush. I think with watercolor, you don't need lots of different sized brushes anyway. a couple of clic and gos and you will likely be set. i think the cup is so awesome. This is actually a good article. One note though. Riding bikes is indeed super beneficial for kids but what should be noted is that many parents don't let the kids practice their balance skills until they are old enough to jump on a regular bike - until then kids ride with a training wheels which doesn't help kids develop their motor skills AT ALL. So parents, remove those training wheels and go for a balance bike instead!